This entry was posted in Current Affairs, Reputation Management, Society and tagged Clinton, economics, Economy, McCain, Obama, penny, Peppercom by RepMan. Bookmark the permalink. Well, I’d suggest a letter-writing campaign to one’s local congressman, but no one writes letters anymore. 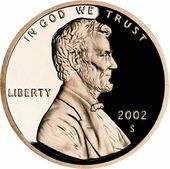 The US Mint doesn’t have the authority to change coin composition on its own. There needs to be some enabling legislation from Congress. Same goes for the nickle!